The reception to the opening episode of Ricky Gervais' latest project 'Derek' proved fairly mixed, albeit falling on the positive side. The lack of humour concerned me but I felt some of the dramatic moments were particularly well played and again, it's more of the same in Episode Two. Except with more actual jokes! Spoilers follow. Admittedly, the episode's opening comedic scene didn't raise my hopes initially. Gervais opting for gross-out comedy as the quite deplorable Kev shat himself at a meeting. Seriously, this character needs to disappear into the background as quickly as possibly. Later in the episode, Karl Pilkington's inspired character Dougie repeatedly notes that "we don't need Kev". AGREED. This episode's focus was on Victoria (Holli Dempsey), sent to the home on community service. Perhaps she was Gervais representation of this generation's oft rudder-less youth, after addressing budget cuts in the previous episode. A short speech from care home manager Hannah (the ever excellent Kerry Godliman) about how footballer's wives and other celebrities have quite depressingly become the new role models for many teenagers certainly hinted at something along those lines. Vicky's situation was exploited for humour, leaving some enjoyable and perhaps on-point enjoyable dialogue between the youngster and Hannah - "What do you read?" "Twitter." Yet she also had the best dramatic moments of the episode, as she realised her own potential and the warmth of giving back. I felt the emotion even with the fairly obvious and predictable manipulation. Elsewhere, we saw the residents have a library visit, entirely appropriate considering the episode aired in the same way as National Libraries Day. Which happens to be today. And perhaps another element of social commentary from Gervais, this time on the importance of preserving libraries. It also happened to be Derek's 50th birthday party which led to the quite bizarre scene of elderly folk dancing to JLS and Will Smith tunes. Unfortunately, followed up by a final sequence involving flashbacks, which was most unnecessary and quite ineffective. Indeed, the series seems to mix these blips with enjoyable heartfelt moments - it's a bit of an infuriating combination yet it's worth putting up with the bad to experience the good in 'Derek'. 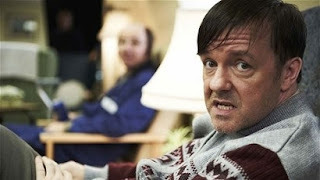 Watch 'Derek' on 4oD for a limited time. The series airs every Wednesday at 10pm on Channel 4..